A Pomelo is a large citrus fruit that tastes like a grapefruit but is slightly less juicy, tangy and has less of a bitter aftertaste. 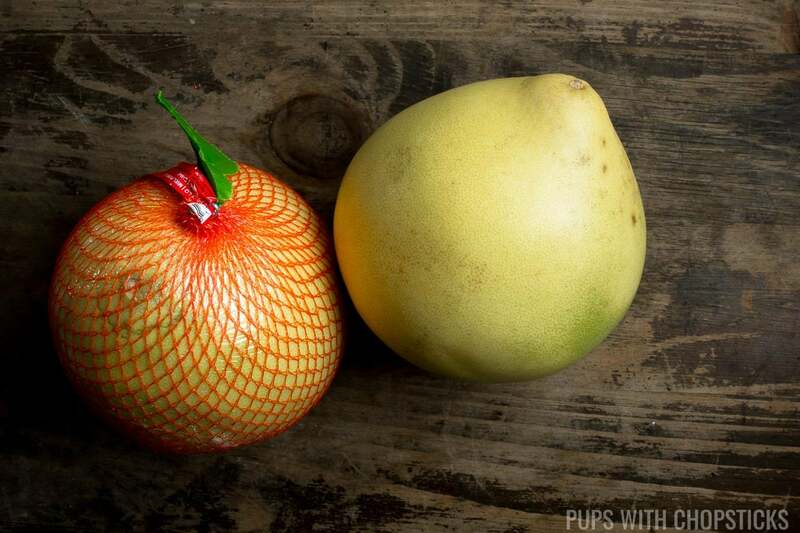 Pomelos are usually eaten as-is but can also be fantastic in salads, drinks and desserts. It is often eaten and enjoyed in Asian cultures especially during Chinese New Year & Mid Autumn Festivals. There are two layers of peeling when it comes to peeling a pomelo. You first have to peel off the outer skin (the rind) and once the skin has been peeled you have to peel the tough skin that’s wrapped around the pulp – the pulp is the only thing eaten in a pomelo. 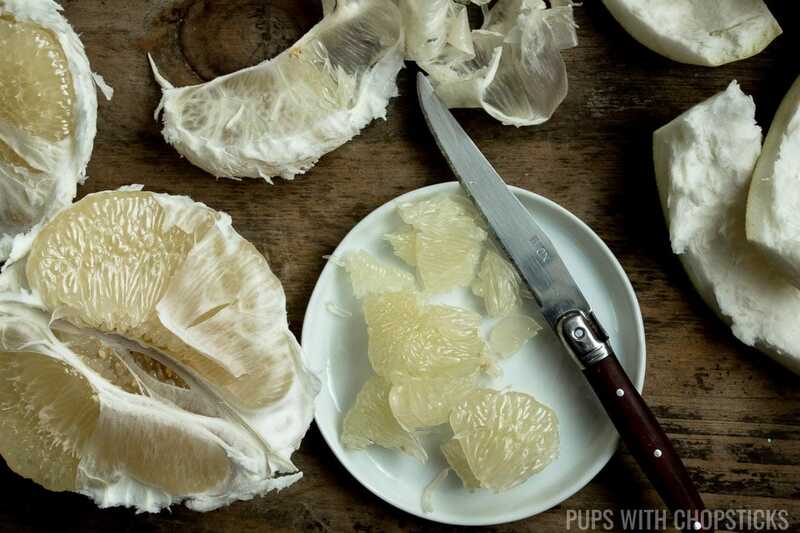 The pulp of the pomelo is usually eaten as-is but can also be fantastic in salads, drinks and desserts. When it comes to food, Asians generally don’t like to waste, so there are Chinese recipes out there to eat the pith of the pomelo skin (the spongy part of the skin, not the zest)! 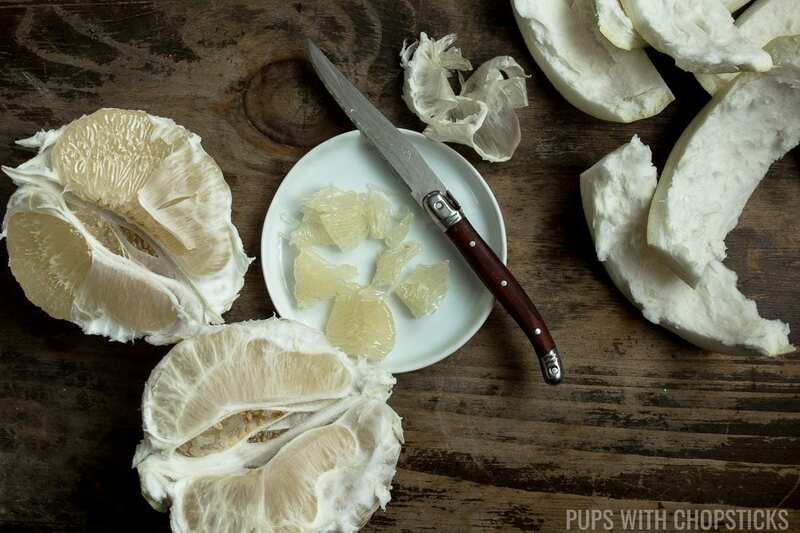 The pith (the spongy part) is usually peeled or cut off the rind and soaked over night and boiled to remove some of the bitterness in preparation for it to be braised. You can find pomelo in Asian grocery stores. They are more commonly available during big events such as Chinese New Year (Lunar New Year) and Mid Autumn Moon Festivals, although I occasionally will find them at my local grocery stores from time to time as well. To pick out the juicy pomelos over the dried ones, just pick it up! 🙂 They should feel heavy for it’s size. The heavier it is, the juicier it is. If it feels very light, they most likely will be dried up inside. A pomelo tastes like a milder version of a grapefruit but it is not as sour and bitter as a grapefruit. It is less juicy as well, so it is much easier to eat once it has been peeled. It’s slightly less juicy than a grapefruit but much easier to eat and makes great bite sized snacks on the go. You don’t eat the skins of a pomelo at all since it is thick and tough. 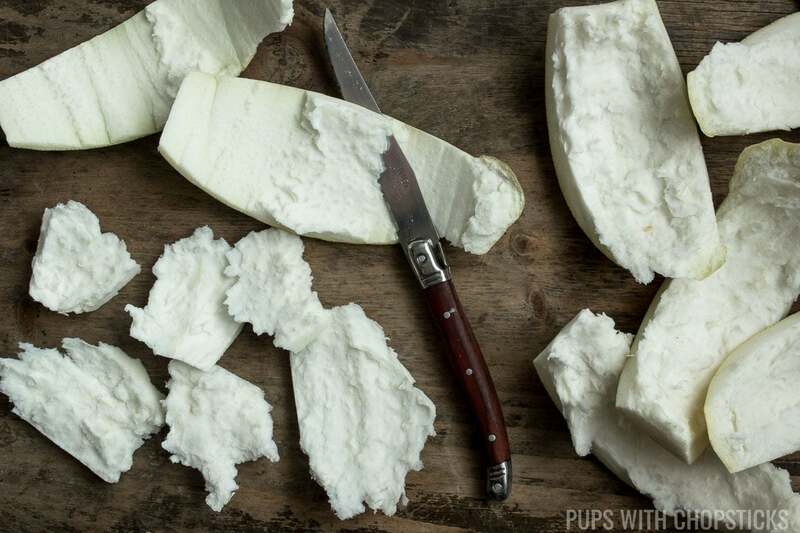 You only eat the pulp, which is very easy to peel out of the skin. 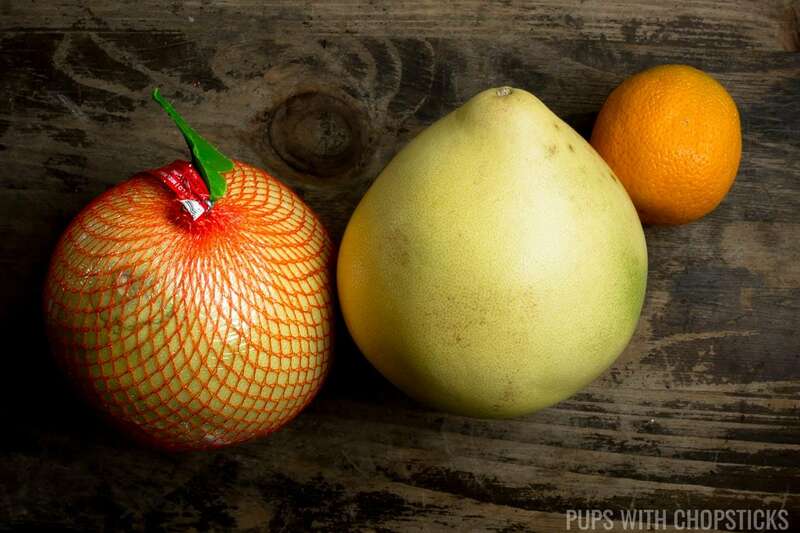 If your pomelo has not been peeled, you can store them in room temperature or the fridge, just like an orange. Once a pomelo has been peeled, keep the segments together and only remove the wedges you want to eat. This will prevent it from drying out. Store it in the fridge in a well sealed container for up to a week.